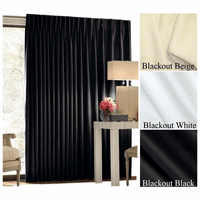 Our CCF Blackout fabric curtains come in 3 popular colors and ship in 2-4 business days! So you can probably find a blackout curtain that will fit your color needs AND your time schedule! They come in a large selection of standard heights and widths. These are a made-to-order product and but can ship in 2-4 business days! They are divided into sections below by height, simply determine the height you want and go into that section and find your width. Once you find the curtain you need choose the color from the selection box and add it to your cart.